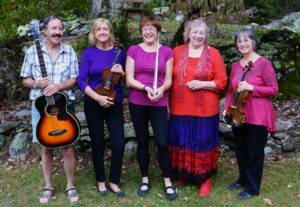 The Reel Thing is a western Connecticut-based band specializing in music for traditional social dances, costumed, authentic colonial dances and music from the 18th century, workshops for children and adults, and community “barn” dances. The group is made up of experienced, professional musicians who have a passion for folk music, dancing and performing. Bill Campbell plays guitar and bass guitar for the band. In addition to his many years of experience, Bill teaches beginner guitar to adults and children. His musical career began in the ’60’s with formal instruction from the Rudi Lionetti Studio in Stamford. He played with bands in high school and college, and he has performed with groups at NOMAD. His other musical passions include the harmonica and bodhran (Irish drum), and he sang for a number of years with the Newtown Choral Society. Bill collects any instruments he sees and hangs them on the wall or makes them living room art. He actually plays some of them. His collection includes multiple harmonicas, violins, guitars, bodhran, stringed pennywhistle, nose flutes, tambourine and mountain dulcimer, along with his wife’s piano, uke, and tambourines. Along with his many other talents, Bill is the genius at making sense of all the sound equipment. Fran Hendrickson has been a dance musician since 1977. She enjoys playing for Colonial Social Dancing, Traditional Squares and Family Dances on either piano or accordion, and has recorded with Connecticut groups Jackson Pike Skifflers and Spring Fever. With her husband Chip, she formed the Hendrickson Group, The Colonial Dancing Master, in 1988 to research and publish social dances and music from the second half of the 18th-century from primary sources. Fran recorded several albums of 18th-century dance music to accompany the choreography in Chip’s books. The Hendricksons taught and performed up and down the East Coast, for Loyalist Days in Saint John, N.B., and in France. Their specialty was the Minuet, and Fran continues to give lessons in the Minuet. Fran was the Coordinator of the Danbury Senior Center for 30 years where, among her duties, she organized a musical band called The Cellmates, (as the senior center was in the historic old Jail) playing continuously from 1984 – 2013. This was a lively group of senior citizens ages 60 into their 90s who played old time music, danced, and sang, bringing joy to all ages. Fran conceived, organized and managed the NOMAD Festival which ran for 20 years, fulfilling a dream to bring an all-volunteer, participatory festival to life, to share with others and to carry on the various folk traditions to the next generation. 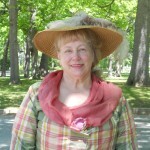 Fran re-organized her business in 2012 as “Hendrickson Group LLC – The Colonial Dancing Master” to continue her late husband’s research and to perform and present programs on 18th-century civilian life. 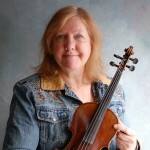 Sue Hill took up the fiddle in September of 1999 and discovered her love for traditional music. Nine months later she entered the New England Fiddle Contest and joined the Old Tyme Fiddlers Club. Growing up in Bristol, CT she played fife in Carey’s Cadets and later learned to strum the guitar. As an adult, she sang in a church choir where she learned to sight read and harmonize. She was influenced by her father who played the harmonica and trumpet and her aunt and grandparents who played the piano. Sue has studied and taken classes with Becky Tracy, Donna Hebert, Jane Rothfield, Jay Ungar, David Kaynor and George Wilson. In September 2006, she won first place in the Intermediate Division at the Blandford Fiddle Contest. Sue also runs a bi-monthly jam in Bristol and gives fiddle lessons. For the past five years, Sue has been holding square and contra dance classes for intellectually challenged adults. She is also a member of the Barn Band, Pot Luck, and Connecticut’s Bristol Old Tyme Fiddlers as well as a guest member for various other bands. 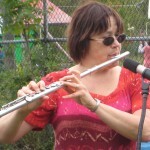 Julie Sorcek, who plays flute and saxophone for The Reel Thing, began playing flute at age 10. Aside from experience playing with high school and college symphonic bands, Julie has performed with the Danbury Community Orchestra, and at the NOMAD, Old Songs, and Philadelphia Folk Festivals. 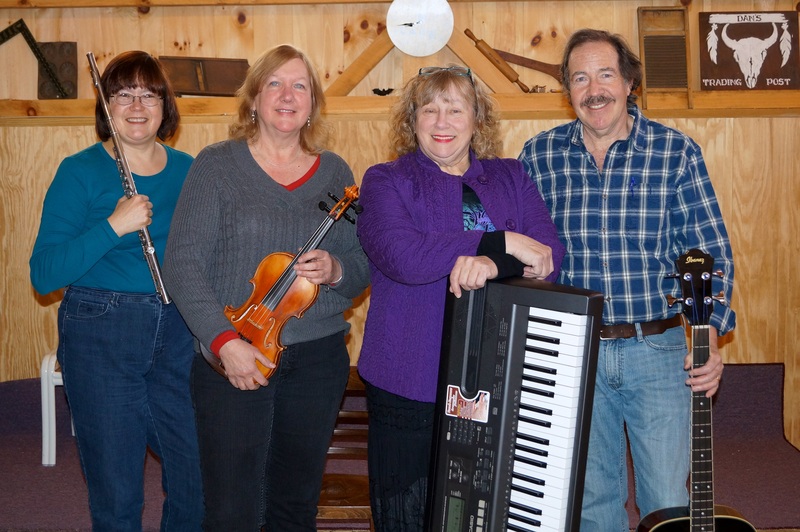 Julie has been a guest musician with the contra dance bands Jane’s Gang and Out on a Whim. She is a founding member of the contra dance band Wry Bred, sings and plays with the rock/pop band Rio and the UBC, and also performs with the folk group Chicks ‘n Sync. Julie can be seen on a regular basis performing with other area musicians at restaurants and coffeehouses in the greater Danbury, CT area. She retired recently as the concert band and guitar ensemble director at Immaculate High School in Danbury. 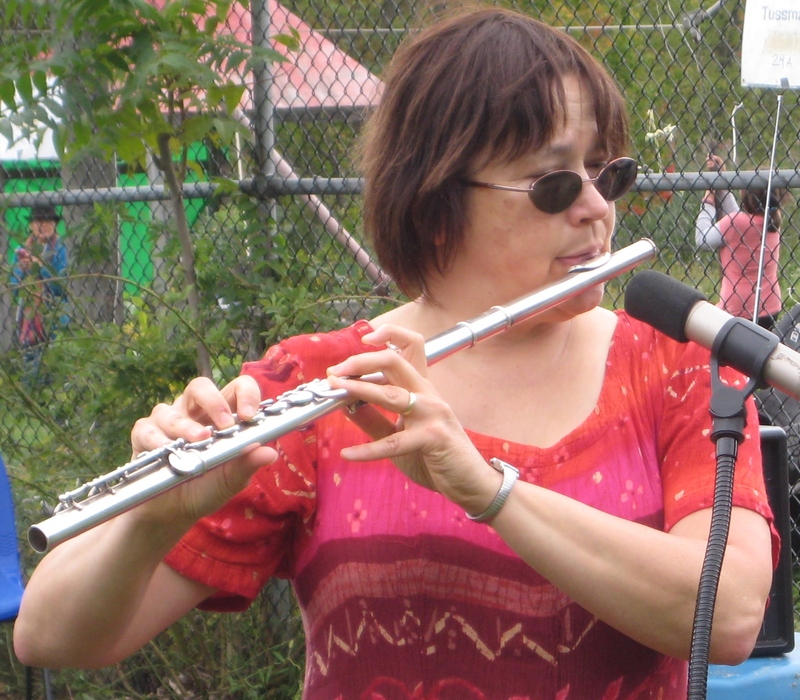 Her repertoire on flute and sax includes contra dance, Celtic, Colonial, jazz, rock/pop, classical, old time, bluegrass, and folk music. Ginny Worrell, the newest member to join the Reel Thing in 2014 plays keyboard and fiddle. A talented musician from New Britain, she grew up in a family dedicated to music. Her mother was a piano teacher and brother and sister both very accomplished musicians too. Her music studies started at the young age of 3 at the Hartt School of Music. Music has always been a huge part of her life as she participated in the Hartt Youth Orchestra, the CT All State Orchestra, and at 13 was the youngest member of the New Britain Symphony Orchestra. For many years, she was piano accompanist for the New Britain Musical Club, the Newington Choral Society, the Plainville Choral Society, Plainville Youth Theater, and a church organist for several local churches. Recently Ginny has been changing her style of music and has had great fun participating in fiddle contests and won 1st place in the Roxbury CT Fiddle contest and 2nd and 3rd places in the Fiddle Festival at the Blandford MA Fair. 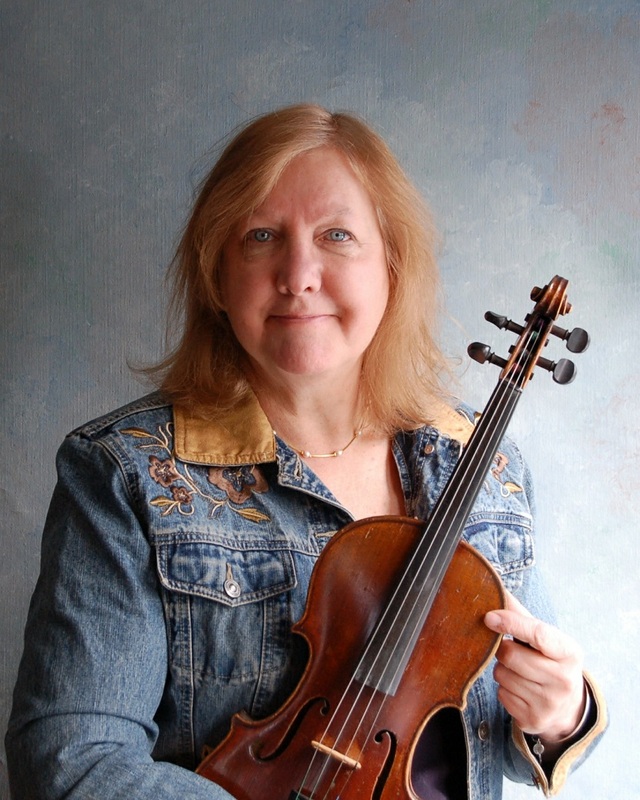 Ginny performs Irish Music with “Stringing You Along” and is currently studying fiddle with Jeanne Freeman of the Connecticut Academy of Irish Music.